In front crawl, a wide arm recovery is a swimming mistake that makes your technique less effective. This article analyzes why this is the case and suggests a few swimming drills to correct this bad habit. The other day at the pool I noticed the arm recovery of a front crawl swimmer. What especially struck me was that he used overly wide arm movements. It looked like he was using more force than necessary during the arm recovery, and especially so because he’s a guy with a muscular build. As I was observing this swimmer’s technique, I started to think about why such a wide arm recovery might be problematic and lead to a less efficient front crawl stroke. So let me explain this in more detail. Because the arm recovery is a non-propulsive phase of the stroke cycle, it makes sense to waste the least amount of energy during that phase. Your muscles are then less tired for the upcoming propulsive phase of the arm stroke. To expend the least amount of energy during the recovery, it should be as relaxed as possible. To do so, you should let your forearm dangle down from the elbow as soon as your arm exits the water. Your hand should be loose and hover just above the water surface. Your elbow should lead the recovery. 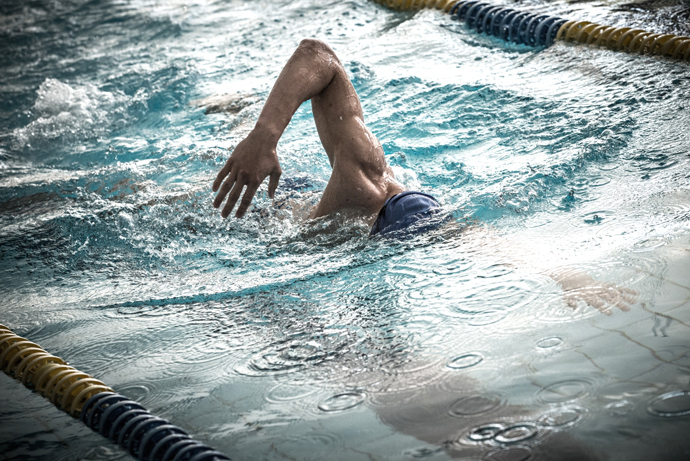 As soon as your hand has passed your head, it should re-enter the water, and your arm should extend forward under water to prevent shoulder impingement, as explained in Front Crawl Swimming Mistakes – Overreaching. Another argument in favor of a compact recovery close above the water surface comes from the fact that the higher you bring your recovering arm above the water surface, the more it will push your body down in the water. This, in turn, is bad because the recovering arm will be lower in the water too, creating more drag. Furthermore, it will also be more difficult for you to get air when you roll on your side to breathe. Assume a horizontal position in the water with your lower arm extended forward, your body rotated on your side and your upper arm resting on the other side of your body. Your face is turned upward to breathe, and you kick using a supple flutter kick. You may use swimming fins. This technique is explained in our Hand-Lead Side Balance Drill. Now, once you are comfortable kicking on your side, rise and extend your upper arm so that it points directly upward. You should notice that your body is pushed deeper down in the water. Now lower your arm and notice how your body buoys up to the surface again. This illustrates why in the front crawl stroke you should keep the recovering arm close to the body. Zipper Switch: In Zipper Switch, you focus on leading the recovery with the elbow and keeping the hand close above the water surface, resulting in an efficient, compact recovery. Over Switch: In Over Switch, you practice entering the water with the recovering arm close in front of your head, which prevents overreaching. Wide recovery also adds wiggle, lateral movement, which greatly increases drag. Hi, thanks for the article. I totally agree with you. 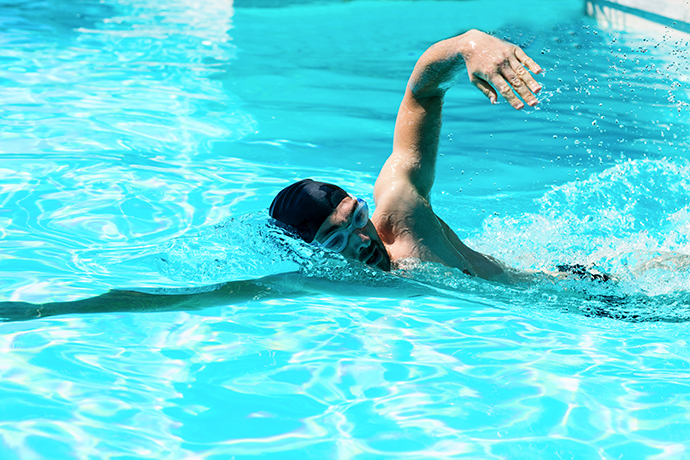 Some swimmers use wide arm recovery because they do not rotate enough. The easiest way to master the relaxed recovery, i.e. narrow arm is to focus on rotation which is obviously leading to a relaxed recovery.